Astronautsaboard the International Space Station are gearing up to continue vital spacecraftrepairs Wednesday for the second in a series of tricky spacewalks to replace afaulty coolant pump. Wednesday'sspacewalk is set to begin just after 7 a.m. ET (1100 GMT). If all goes well,the astronauts will finally be able to replace the pump on the station'sstarboard truss in an extra spacewalk scheduled for Sunday. Theupcoming spacewalk follows an eight-hour, three-minute excursion Saturday thatis the sixth longest in history, but fell short of its intended goal ofremoving the oven-sized pump module. First,one of four ammonia coolant hoses was jammed. Then, after Wheelock used ahammer to bang it free, the hose leaked a substantial amount of ammonia ? somuch that the astronaut called it a "snowstorm." NASAmission planners on Earth regrouped after the Saturday spacewalk to alter plansfor what will now require a total of atleast threerepair spacewalks to mend. Spacestation managers have choreographed a series of procedures for Wheelock andCaldwell Dyson to perform at the start of Wednesday's spacewalk that are"designed to greatly reduce, or eliminate the possibility of ammonialeaking from the final fluid connector ? called M3 ? when it is demated to setthe stage for the failed pump to be removed from the truss," NASAofficials said in a statement. Theplan requires the astronauts to close off separate hoses of ammonia coolant onthe station's starboard truss, effectively isolating ammonia upstream in thesystem from the final connector. This should prevent further leakage during the installation of the new pump. Mission planners have also been vigilant in taking precautions to avoid contamination from the ammonia. Overnight,ground controllers activated a pressure regulator valve that lowered theoverall pressure in the plumbing for the inactive cooling loop. This will helpWheelock and Caldwell Dyson close two valves needed to isolate the ammonia, andwill also facilitate with the reconnection of the fluid lines once the new pumpis installed. Theastronauts will use a tool to vent any residual ammonia from the failed pump module before the final hose is disconnected. ? Wheelockand Caldwell Dyson will also configure the coolant lines and valves beforedisconnecting electrical data connections from the old pump and parking it on astowage bracket on the space station's Mobile Base System. 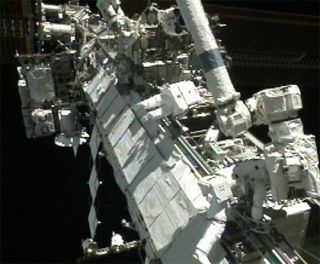 Theinstallation of the new pump is targeted for the third spacewalk, which isexpected to occur no earlier than Sunday. The station?s systems remain in good condition operating on the second of twocooling loops available for the complex. Wheelockand Caldwell Dyson will move into the Quest airlock later today to begin theirovernight "campout" to reduce the nitrogen in their bloodstreams. Theammonia pump failed July 31, knocking out half of the space station's cooling system and forcing astronauts to turn off some experimentsand systems, as well as leave others without backups, in order to prevent thestation from overheating. A tripped circuit breaker, likely caused by a powerspike, caused the malfunction, station managers have said. TheInternational Space Station uses liquid ammonia to cool its onboard systems bytransporting waste heat to a network of radiators mounted to its main truss.There are two main cooling system loops ? Loop A and Loop B. The failed pump isin Loop A, while the other cooling loop remains operational. Thefailed ammonia pump is located on the station's right side truss and will bereplaced with one of four spare pumps stored at the orbiting lab. Eachpump weighs 780 pounds (353 kg) and is 5 1/2 feet long (1.6 meters) by 4 feetwide (1.2 meters). They are about 3 feet (almost 1 meter) tall. NASAwill broadcast the International Space Station spacewalk repairs live fromspace on NASA TV,with the first spacewalk slated to begin Wednesday at 6:55 a.m. ET (1055 GMT). Click here for space station mission updates and SPACE.com'sNASA TV feed.